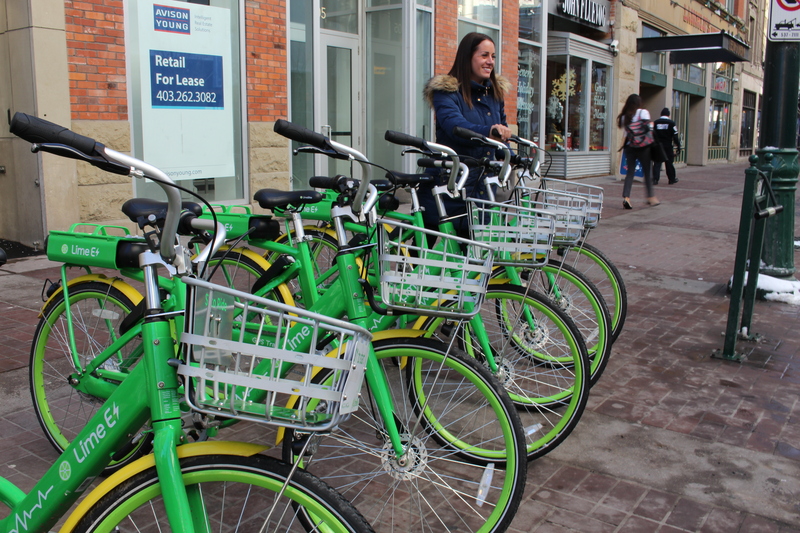 Lime, a U.S.-based electric bike rental company, has made its Canadian debut in Calgary but is failing to meet the standards of the Alberta Traffic Safety Act. 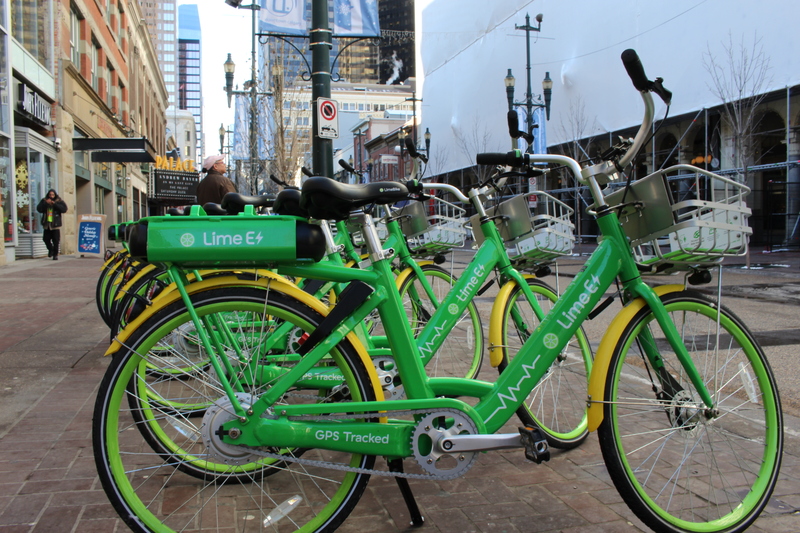 Shortly after Lime’s Calgary launch last November, bike riders received backlash from the Calgary Police Services for not following the rules outlined in the traffic safety act. The act regards bicycles as vehicles, and says that Lime riders must obey all provincial rules applying explicitly to bicycles. Those rules require that all riders wear a helmet while cycling, and ride only on designated bike lanes. Lime bikes are not permitted on Calgary Transit bike racks and are not allowed on CTrains during rush hour (6:30 a.m. to 9 a.m. and 3 p.m. to 6 p.m.). In addition, riding bikes on sidewalks can result in a ticket. “Cyclists should follow all traffic laws. Almost everything that applies to cars also applies to them,” Lime operations consultant Scott Harvey said in an interview. “This includes rules about speed limits, signalling turns, traffic signals, and careless and distracted driving,” he added. However, Lime bikes are exempt from impaired driving legislation and are not considered to be a vehicle in that case. So, riders won’t have to worry about getting stopped for riding after a few bevies. But Lime cyclists will have to slow down and obey traffic laws if they want to avoid getting pulled over. Const. Roger Reinson from the Calgary Police Services said that there has been a problem with Lime riders not following speed limits, failing to signal and to obey traffic laws. He also added that cyclists who are younger than 18 years old are required to wear a helmet when riding, and adults are encouraged to do the same. The cost for first-time Lime riders is $1 to unlock and 30 cents per minute. Lime-E electric-assist bikes are equipped with a 250-watt motor and can travel a maximum speed of 30 km/h. In order to qualify to ride the bikes, individuals must apply through the Lime bike app, or online through Lime’s website. A Lime representative will get back to the customer within two days with instructions and all applicants must be prepared to present a valid government-issued photo ID and credit card. “It’s very convenient when you’re running an errand downtown. It helps me [to] be more environmentally conscious,” said Lime bike rider Myah Taha. Similar to Car2Go, the short haul car rental service, Lime riders can only travel within an allowed radius in the city centre. The Lime app shows users where the bikes are located at any given time. “Lime bikes are easy to ride. As soon I began to pedal, I got an extra push from the electricity, which is amazing,” said Taha. For more information regarding Lime bike rules visit Lime’s website or download the app. Electric Avenue Lime-E electric-assist bikes are equipped with a 250-watt motor and can travel at a maximum speed of 30 km/h. As a news reporting and communications major in the journalism program at SAIT, Alaa Abdalla is working as a writer for The Press during the 2018-19 academic year.